Since the beginning of the decade, nonprofit organization Bugles Across America (BAA) has filled a critical role in providing one last "thank you" to veterans of the armed forces. On Veterans Day, this Wednesday, Nov. 11, Bugles Across America will be involved with "Echo Taps from the Heart," an event that will bring together enough buglers to stretch across five miles of road in Elkhart, Ind. to play taps. Four years ago, Bugles Across America made the Guinness Book of World Records for creating the longest line of horn players ever assembled; 878 players stretching 41 miles from Elmira, N.Y., through Corning and into Bath, N.Y. This line of individuals simultaneously played taps in reverent salute to those deceased veterans who served their country in the armed forces. After Bugles Across America founder Tom Day sent a number of horns to be re-plated at Anderson Silver Plating in Elkhart, along with a video of the New York feat, he received an inquiry about organizing a similar event in and around Elkhart. The northern Indiana town is significant to the world of professional, amateur and student artists with a large number of music-related companies headquartered in the area including Conn-Selmer, Inc., a leading manufacturer and distributer of some 20 brands of musical instruments. According to Day, "Many of the people involved in making and refurbishing brass instruments will be in attendance, as will members from high school bands, four color guards, and various drum corps alums. The event is being filmed by German television in an effort to show people in Europe how America values its veterans." Volunteer horn players can still get involved with the event this Wednesday. Those who are interested should call Terry Vantine of Anderson Silver Plating at 574.262.0083 after 5 p.m. ET. Bugles Across America now provides buglers, free of charge, for the funerals of 2,500 veterans every month. About 20 national cemeteries call on BAA volunteers for the funerals of veterans at their facilities. The busiest such facility, Riverside National Cemetery in California, utilizes BAA members for about 65 funerals every day. The organization's volunteers have also started to sub at Arlington National Cemetery when official military buglers are unavailable. The organization has distributed more than 600 horns, free of charge, to volunteers who wish to be available to play taps at veterans' funerals, but who don't have an appropriate instrument of their own. With 7,200 members throughout the United States, Canada, the Solomon Islands, Great Britain and Germany, a worldwide network of Bugles Across America volunteers continues to grow. 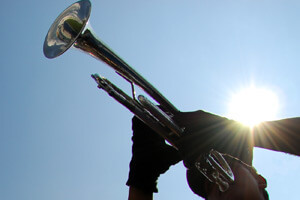 Learn more about Bugles Across America in this DCI.org article.